Concerning the final determination with respect to the dumping of certain corrosion-resistant steel sheet from China, the Separate Customs Territory of Taiwan, Penghu, Kinmen and Matsu (Chinese Taipei), India and South Korea. On January 22, 2019, pursuant to paragraph 41(1)(b) of the Special Import Measures Act, the Canada Border Services Agency made a final determination respecting the dumping of certain corrosion-resistant steel sheet from China, the Separate Customs Territory of Taiwan, Penghu, Kinmen and Matsu (Chinese Taipei), India and South Korea. On June 5, 2018, the Canada Border Services Agency (CBSA) received a written complaint from ArcelorMittal Dofasco G.P., of Hamilton, Ontario, (hereinafter, “the complainant”), which was supported by Stelco Inc.Footnote 1 of Hamilton, Ontario, alleging that imports of certain corrosion-resistant steel sheet (COR) from the People’s Republic of China (China), the Separate Customs Territory of Taiwan, Penghu, Kinmen and Matsu (Chinese Taipei), the Republic of India (India) and the Republic of Korea (South Korea) (hereinafter “the subject goods”) are being dumped. The complainant alleged that the dumping has caused injury and is threatening to cause injury to the Canadian industry producing like goods. On June 26, 2018, pursuant to paragraph 32(1)(a) of the Special Import Measures Act (SIMA), the CBSA informed the complainant that the complaint was properly documented. The CBSA also notified the governments of China, the Separate Customs Territory of Taiwan, Penghu, Kinmen and Matsu (Chinese Taipei), India and South Korea that a properly documented complaint had been received. The complainant provided evidence to support the allegations that imports of the subject goods have been dumped. The evidence also disclosed a reasonable indication that the dumping has caused injury and/or is threatening to cause injury to the Canadian industry producing like goods. On July 26, 2018, pursuant to subsection 31(1) of SIMA, the CBSA initiated an investigation respecting the dumping of the subject goods. Upon receiving notice of the initiation of the investigation, the Canadian International Trade Tribunal (CITT) commenced a preliminary injury inquiry, pursuant to subsection 34(2) of SIMA, into whether the evidence discloses a reasonable indication that the alleged dumping of the goods has caused injury or retardation or is threatening to cause injury to the domestic industry producing the like goods. On September 24, 2018, pursuant to subsection 37.1(1) of SIMA, the CITT made a preliminary determination that there is evidence that discloses a reasonable indication that the dumping of COR from China, the Separate Customs Territory of Taiwan, Penghu, Kinmen and Matsu (Chinese Taipei), India and South Korea has caused injury or is threatening to cause injury to the domestic industry. On October 24, 2018, as a result of the CBSA’s preliminary investigation and pursuant to subsection 38(1) of SIMA, the CBSA made a preliminary determination of dumping of the subject goods. On the same date, pursuant to subsection 8(1) of SIMA, provisional duty was imposed on imports of dumped goods that are of the same description as any goods to which the preliminary determination applies, and that are released during the period commencing on the day the preliminary determination was made and ending on the earlier of the day on which the CBSA causes the investigation in respect of any goods to be terminated pursuant to subsection 41(1) of SIMA or the day the CITT makes an order or finding pursuant to subsection 43(1) of SIMA. On October 25, 2018, the CITT initiated an inquiry pursuant to section 42 of SIMA to determine whether the dumping of the goods has caused injury or retardation or is threatening to cause injury to the domestic industry. Based on the available evidence, the CBSA is satisfied that COR originating in or exported from China, the Separate Customs Territory of Taiwan, Penghu, Kinmen and Matsu (Chinese Taipei), India and South Korea has been dumped. Therefore, on January 22, 2019, the CBSA made a final determination of dumping pursuant to paragraph 41(1)(b) of SIMA in respect of those goods. The CITT’s inquiry into the question of injury to the domestic industry is continuing, and it will issue its decision by February 21, 2019. Provisional duty will continue to be imposed on the subject goods until the CITT renders its decision. The Period of Investigation (POI) for the dumping investigation is April 1, 2017 to March 31, 2018. The Profitability Analysis Period (PAP) for the dumping investigation is April 1, 2017 to March 31, 2018. ArcelorMittal Dofasco G.P. was founded as the Dominion Steel Casting Company in 1912 in Hamilton, Ontario. In 2006, Dofasco was acquired by Arcelor S.A. Later that year, Arcelor S.A. merged with Mittal Steel. ArcelorMittal Dofasco G.P. produces COR at its facility in Hamilton, Ontario. The company is the largest of the three known producers of COR in Canada and accounts for a major proportion of the total domestic production of like goods. The trade unions did not make any submissions during the investigation. At the initiation of the investigation, the CBSA identified 82 potential importers of the subject goods from CBSA import documentation and from information submitted in the complaint. All of the potential importers were asked to respond to the CBSA’s Importer Request for Information (RFI)Footnote 2 to obtain information on their imports of the subject goods. In addition, importers were requested to provide information respecting re-sales in Canada of like goods imported from a third country. Five importers provided a response to the Importer RFI. Twenty-six companies provided a response to the Dumping RFI.Footnote 5 Respondents included producers and exporters as well as intermediary companies (agents, trading companies, vendors, etc.). In addition, four companies in China provided responses to the Section 20 RFI. Information on the results of the investigation pertaining to the companies who provided a response to the Dumping RFI and were considered to be exporters of the subject goods for SIMA purposes are summarized under the Results of the Dumping Investigation of this document. For the purposes of this investigation, Government of China (GOC) refers to all levels of government, i.e., federal, central, provincial/state, regional, municipal, city, township, village, local, legislative, administrative or judicial, singular, collective, elected or appointed. It also includes any person, agency, enterprise, or institution acting for, on behalf of, or under the authority of, or under the authority of any law passed by, the government of that country or that provincial, state or municipal or other local or regional government. At the initiation of the investigation, the CBSA sent a Government Section 20 RFI to the GOC.Footnote 7 The GOC did not respond to the CBSA’s Section 20 RFI. The product definition includes corrosion-resistant steel sheet where the substrate is coated or plated with a corrosion-resistant material such as zinc, aluminum, and other alloys. The coating may be applied by a variety of processes including hot-dip galvanizing or electro-galvanizing. The product definition includes corrosion-resistant steel sheet which has been chemically passivated by coating with standard or acrylic chromate and non-chromate solutions. Passivation refers to a material becoming “passive”, that is, less affected or corroded by the environment of future use. Passivation involves creation of an outer layer of shield material that is applied as a micro-coating, created by chemical reaction with the base material, or allowed to build from spontaneous oxidation in the air. As a technique, passivation is the use of a light coat of a protective material, to create a shell against corrosion. The most common method of passivation for steel products is the application of a standard chromate based or acrylic chromate and non-chromate coatings. Passivation treatments provide protection against oxidation during handling, transportation, and storage, and they also add lubricity during the forming or stamping of the part. Corrosion-resistant steel sheet is usually produced from cold-rolled carbon steel sheet (“CRS”) and sometimes from hot-rolled carbon steel sheet (“HRS”). However, additions of certain elements, such as titanium, vanadium, niobium or boron, during the steel-making process enable the steel to be classified as alloy steel. Therefore, corrosion-resistant steel produced from either carbon steel or alloy steel is included in the definition of the subject goods. The product definition excludes corrosion-resistant steel for use in automobiles and automobile parts, hereafter referred to as “automotive”. Automotive end users include original equipment manufacturers (“OEMs”) and auto part producers. Such excluded goods normally fall under Customs Tariff item 9959.00.00. The product definition excludes corrosion-resistant steel sheet products that have been pre-painted or coated with organic (non-metallic) coatings. In Canada, the commonly used term for steel that has been coated with paint at the mill is “pre-painted” or “pre-coated” steel. Outside Canada, it is common for the term “organic coated” to be used to describe pre-painted steel. “Organic coated” may also refer to permanently applied plastic coatings or films. Common paint types for pre-painted and other organic coating products are silicon modified polyester, polyester, polyurethane, acrylic, epoxy, epoxy phenolic, polyvinylchloride and polyvinylidene difluoride. The product definition includes “seconds”. Seconds are goods that do not meet some aspect of the original specification. This could include dimensions, grade, or coating. It could also include a coil that has been damaged. Seconds are sold at a discount. Seconds may meet ASTM, SAE or other specifications or may be re-certified to meet a standard. For example, a coil that is damaged along the edge may be a “second”. However, if the damaged edge is slit and the damage is removed, the coil could be classified as a primary coil produced to the new width. Seconds are graded and sold on a scale of five. COR is usually produced from CRS and sometimes from HRS. The steel sheet to be coated is commonly referred to as steel substrate. Hot-dip galvanizing and electrogalvanizing are the two processes that can be used to coat the substrate steel sheet with zinc, aluminum, or other alloys. The complainant uses hot-dip galvanizing. In the hot-dip galvanizing process, the first step is to clean the surfaces to improve the adhesion of the coating. After cleaning, the substrate enters a continuous annealing furnace. The furnace heats the substrate to the temperature necessary to develop the desired metallurgical properties of the final product. The substrate is then placed in a molten coating bath and, as it emerges from the bath, an air, nitrogen or steam wipe is used to control the thickness of the coating. The galvanized steel sheet is then cooled in a cooling tower. In some cases, the galvanized steel is further processed into galvannealed steel sheet. The first step in galvannealing is to reduce the thickness of the coating. This can be done either by “wipe-coat galvannealing”, in which thick pads are used to wipe the sheet as it emerges from the molten coating bath, or by an air/nitrogen wiping process. The galvanized sheet then passes through a galvannealing furnace, with the heat from the furnace causing the iron from the substrate to combine with the zinc coating to produce a thin zinc-iron alloy. Because of its thinner coating, galvannealed steel sheet is easier to weld and paint than galvanized steel sheet. In the electro-galvanizing process, charged steel passes through a plating bath and opposite electrical charges cause the zinc solution to coat the steel. Cold-rolled steel coils are batch annealed in multi-stack furnaces or in off-line continuous annealing process, often skin passed on a temper mill, before being electro-galvanized with a thin coating of zinc on a continuous processing line. Common applications for COR falling within the product definition include, but are not limited to, production of farm buildings, grain bins, culverts, garden sheds, roofing material, siding, floor decks, roof decks, wall studs, drywall corner beads, doors, door frames, ducting (and other heating and cooling applications), flashing, hardware products and appliance components. The listing of tariff numbers is for convenience of reference only. The tariff numbers may include non-subject goods. Also, the subject goods may fall under tariff numbers that are not listed. Refer to the product definition for authoritative details regarding the subject goods. After considering questions of use, physical characteristics and all other relevant factors, the CBSA initiated its investigation under the premise that domestically produced COR are like goods to the subject goods. Further, the CBSA was of the opinion that the subject goods and like goods constitute only one class of goods. The complainant and the supporting producer, Stelco Inc., account for nearly all of the domestic production of like goods. *The total may not add to 100% due to rounding to one decimal point. Regarding the dumping investigation, information was requested from all known and potential exporters, producers, vendors and importers, concerning shipments of COR released into Canada during the POI. Regarding the section 20 inquiry, information was requested from all known and potential exporters and producers of COR in China and from the GOC. As the investigation already included appropriate “surrogate producers”, no additional producers not named in this investigation were requested to provide information for the purposes of determining normal values under paragraph 20(1)(c) of SIMA. These producers were considered appropriate as they operate in well-developed COR industries and under competitive conditions. Furthermore, importers were requested to provide information respecting re-sales in Canada of like goods imported from a third country in order to gather information to determine normal values under paragraph 20(1)(d) of SIMA. The GOC and the exporters/producers were notified that failure to submit all required information and documentation, including non-confidential versions, failure to comply with all instructions contained in the RFI, failure to permit verification of any information or failure to provide documentation requested during the verification visits may result in the margin of dumping and the assessment of anti-dumping duty on the subject goods being based on facts available to the CBSA. Further, they were notified that a determination on the basis of facts available could be less favorable to them than if complete, verifiable information was made available. Under Article 15 of the World Trade Organization (WTO) Anti-dumping Agreement, developed countries are to give regard to the special situation of developing country members when considering the application of anti-dumping measures under the Agreement. Possible constructive remedies provided for under the Agreement are to be explored before applying anti-dumping duty where they would affect the essential interests of developing country members. As India is listed as a least developed country, other low income country or lower middle income country or territory on the Development Assistance Committee List of Official Development Assistance RecipientsFootnote 12, the CBSA recognizes this country as a developing country for purposes of actions taken pursuant to SIMA. Accordingly, the obligation under Article 15 of the WTO Anti-dumping Agreement was met by providing the opportunity for exporters to submit price undertakings. In this particular investigation, the CBSA did not receive any undertaking proposals from exporters in India. Several parties requested an extension to respond to their respective RFIs. The CBSA reviewed each request and granted extensions in instances where the reasons for making the requests constituted unforeseen circumstances or unusual burdens. Where an extension request was denied, the CBSA informed the parties that it could not guarantee that submissions received after the RFI response deadline would be taken into consideration for the purposes of the preliminary phase of the investigation. After reviewing the RFI responses, supplemental RFIs (SRFIs) were sent to several responding parties to clarify information provided in the responses and request any additional information considered necessary for the investigation. On-site verifications were conducted at the premises of three exporters in the Separate Customs Territory of Taiwan, Penghu, Kinmen and Matsu (Chinese Taipei) and three exporters in South Korea. CBSA officers also conducted on-site verifications at the premises of two trading companies in South Korea. Desk audits were conducted for the remaining responding exporters. Details pertaining to the information submitted by the exporters in response to the Dumping RFI as well as the results of the CBSA’s dumping investigation, including the section 20 inquiry, are provided in the Dumping Investigation section of this document. As part of the final phase of the investigation, case briefs and reply submissions were provided by counsels representing the complainant, seven exporters and one trading company. Details of the representations are provided in Appendix 2. The following presents the results of the investigation into the dumping of the subject goods. In the case of a prescribed country such as China, if, in the opinion of the President of the CBSA, the government of that country substantially determines domestic prices and there is sufficient reason to believe that the domestic prices are not substantially the same as they would be in a competitive market, the normal values are generally determined on the basis of section 20 of SIMA using either the selling prices or the full costs of like goods in a “surrogate” country, or using re-sales in Canada of goods imported from a “surrogate” country. The margin of dumping by exporter is equal to the amount by which the total normal value exceeds the total export price of the goods, expressed as a percentage of the total export price. All the subject goods shipped to Canada during the POI are included in the margins of dumping of the goods. Where the total normal value of the goods does not exceed the total export price of the goods, the margin of dumping is zero. The complainant alleged that the conditions described in section 20 prevail in the flat-rolled steel industry sector, which includes COR, in China. That is, the complainant alleged that this industry sector in China does not operate under competitive market conditions and consequently, prices established in the Chinese domestic market for COR are not reliable for determining normal values. The complainant provided evidence supporting the claim that the GOC substantially determines prices of COR sold in China, including a pricing analysis. The complainant also provided evidence of state-ownership in the steel industry, involving both producers and purchasers, including those in the flat-rolled steel industry sector. The complainant also cited specific GOC policies such as China’s 2015 Steel Adjustment Policy and China’s 13th Five-Year PlanFootnote 14 as evidence of continued influence on market forces in China, including the flat-rolled steel industry sector, which includes COR. At the initiation of the investigation, the CBSA had sufficient evidence, supplied by the complainant and from its own research and past investigation findings, to support the initiation of a section 20 inquiry to examine the extent of GOC involvement in pricing in the flat-rolled steel industry sector, which includes COR. The information indicated that prices in China in this sector have been influenced by various GOC industrial policies. Consequently, the CBSA sent Section 20 RFIs to producers and exporters of COR in China, as well as to the GOC, to obtain information on the extent to which the GOC is involved with the determination of domestic prices in the flat-rolled steel industry sector, which includes COR. An RFI was sent to the GOC requesting information for the purposes of the section 20 inquiry. However, the GOC did not provide a response to the Government Section 20 RFI or any other information with respect to the investigation. As the investigation already included appropriate potential “surrogate producers”, surrogate RFIs were not sent to COR producers in any other countries. These producers were considered appropriate as they operate in well-developed COR industries and under competitive conditions. The CBSA received substantially complete and reliable responses to the Dumping RFI from three companies in the Separate Customs Territory of Taiwan, Penghu, Kinmen and Matsu (Chinese Taipei) and one company in South Korea. As part of the section 20 inquiry, the RFIs sent to importers requested information on re-sales in Canada of COR imported from sources other than China, the Separate Customs Territory of Taiwan, Penghu, Kinmen and Matsu (Chinese Taipei), India and South Korea. The CBSA received five responses to the Importer RFI. However, only one importer provided information on re-sales in Canada of like goods from non-subject countries. The following is the CBSA’s analysis of the relevant factors that are present in the flat-rolled steel industry sector in China, which includes COR. 12th Five-Year Development Plans for the steel industry. The GOC adopted its 13th Five-Year Plan for Economic and Social Development (13th Five-Year Plan)Footnote 16 on March 15, 2016. The 13th Five-Year Plan outlines China’s goals, principles and targets for its development for the period of 2016-2020, which covers the POI for this investigation. The objectives outlined in the 13th Five-Year Plan continue the themes expressed in the 12th Five-Year Plan, which is discussed in a later section. This includes the strengthening of state owned enterprises (SOEs) and control over the economy within the steel industry. On January 8, 2018, the Ministry of Industry and Information Technology of China issued the Steel Capacity Replacement PolicyFootnote 18 to cut existing steel production capacity and strictly ban the launch of any new steelmaking facilities in 2018. The new policy is to ensure zero growth of production capacity in steel, cement and plate glass industries and to continue capacity replacement measures this year. According to a reportFootnote 19 by South China Morning Post, China fulfilled its target of cutting back steel capacity by 50 million metric tonnes in 2017, as well as phasing out another 120 million tonnes of low-tech illicit steel product capacity. China also plans to meet the 2016 to 2020 capacity cutback target of eliminating up to 150 million tonnes ahead of schedule in 2018. The analysis on the 13th Five-Year Plan together with the other similar administrative policies of the steel industry discussed below, indicate that the GOC plays a key role in the control and administration of the steel industry, which includes the flat-rolled steel industry sector. On November 14, 2016, the Ministry of Industry and Information Technology of China issued the Iron and Steel Industry Adjustment and Upgrade Plan (2016 - 2020)Footnote 20, to support the Chinese steel industry’s development in the next five years. The plan aims to raise the average annual growth rate of industrial added value from 5.4% in 2015 to 6.0% by 2020, raise the capacity utilization rate from 70% in 2015 to 80% by 2020 and raise the industrial concentration in top ten producers from 34.2% in 2015 to 60% by 2020. As supporting measures, the plan calls on local governments to utilize existing funds, explore multiple kinds of support measures and guide financial institutions and social funds to support key tasks of the plan. In analyzing the Iron and Steel Industry Adjustment and Upgrade Plan (2016-2020) together with the discussion on the draft Iron and Steel Industrial Restructuring Policy (2015 Revision) below, indications are that the GOC continued its level of control in the administration of the flat-rolled steel industry sector. On March 20, 2015, the Ministry of Industry and Information Technology released a draft document entitled, Iron and Steel Industrial Restructuring Policy (Steel Restructuring Revision).Footnote 27 The Steel Restructuring Revision is intended to replace the National Steel Policy previously issued in 2005. This extract also indicates that the GOC has realized that the current steel industry is not in a fair and competitive market environment. Based on the above objectives, tasks and measures outlined in the Steel Restructuring Revision, indications are that the GOC intends to continue the restructuring of the steel industry; set capacity requirements and profitability and productivity targets. The CBSA views the role of the GOC in the management and supervision over the Chinese steel industry as indicative of its continued control of the steel industry. There are common measures between these two GOC policies, as the Steel Revitalization/Rescue Plan is an acceleration of the major objectives of the National Steel Policy. In the Steel Revitalization/Rescue Plan, the GOC asserts its strict control over new or additional steel production capacity and promotes new GOC directed mergers and acquisitions to reform the Chinese steel industry into larger conglomerates, with an increased emphasis on steel product quality. These measures and reforms affect the steel industry in China and, as a result, affect COR producers in the flat-rolled steel industry sector. Also included in this plan are minimum requirements for steel production in order to eliminate smaller players in the market. Through this plan, the GOC continued its reform and restructuring of the Chinese steel industry. The GOC’s target was that by 2015, China’s top 10 steel producers would represent 60% of the country’s total steel output. According to the National Steel Policy, the long-range GOC target for mergers and acquisitions is to have the top 10 Chinese steel producers account for 70% of total national steel production by 2020. This plan was to be part of the next development stage of GOC directives aimed at achieving this long-range 2020 target. The GOC’s direction of the steel industry includes enabling regional or provincial governments to combine enterprises across boundaries. Furthermore, as a result of the GOC’s administration of steel production capacity, the Chinese steel industry remains under the purview of the GOC. Together with the GOC’s legislation: Criterion for the Production and Operation of Steel IndustryFootnote 36 – GY  No. 105 and Several Observations of the General Office of the State Council on Further Strengthening Energy-saving and Emission Reduction Efforts as well as Accelerating of Restructuring of Steel IndustryFootnote 37 – GBF (2010) No. 34, these plans set out requirements for existing production and operations of steel enterprises in China at the time. Should steel enterprises not follow the GOC’s requirements, laws, and industrial policies, there are repercussions which include the withdrawal of steel production licenses and credit support. The CBSA is of the view that state-owned and state-controlled enterprises in the steel industry in China are under the direction of GOC industrial policies and objectives, and this entails that these steel producers do not necessarily operate under market conditions. The CBSA reviewed the most recent data available on steel production as reported by the World Steel Association (WSA). Based on this information, the top 10 steel producers by volume in ChinaFootnote 38 accounted for 37.3% of all steel production in China in 2017.Footnote 39 Of these 10 producers, eight are state-owned, and the combined production of steel by these top eight state-owned enterprises in China represents 30.3% of all steel production in China in 2017. As a result of GOC steel policies aimed at supply side structural reform, on September 22, 2016, Baosteel Group and Wuhan Steel Group consolidated by merging into BaoWu Steel Group, the second largest by production volume of crude steel, among global iron and steel companies. The result of the merger has led to a stronger and more influential state-owned entity and greater concentration in the steel industry. The GOC’s extensive ownership and control of the majority of large Chinese steel producers means that these companies likely produce and market steel according to GOC objectives and policies instead of market conditions. Given that the state-owned steel companies produce raw material inputs for cold-rolled and hot rolled steel sheet, which are also a direct input material in the production of COR, there is a strong likelihood that prices of COR are also distorted. The presence of state-owned and state-controlled enterprises that produce COR in the flat-rolled steel industry sector would necessitate that private companies supplying COR would have to compete with these state-owned and stated-controlled enterprises operating under non-market conditions. The CBSA concurs with the complainant’s analysis, which demonstrates the GOC’s influence over the price of material inputs in producing COR. There is evidence that the GOC maintains export controls on raw materials used in the production of steel. These GOC measures limit or prevent the export of the raw materials resulting in increasing supply in the Chinese domestic market causing downward pressure on domestic prices. On January 1, 2017, the GOC imposed an export tax of 15% on pig iron, steel billets, and steel slab.Footnote 45 The extra burden imposed on the export of such steel products is likely to increase their supply in the Chinese domestic market and cause downward pressure on domestic prices on such products and products made therefrom, such as cold-rolled and hot-rolled steel sheet, which are the main raw material input in the production of COR. Similarly, steel slab is a major input for steel plate, which in turn is a major input for flat-rolled steel. The export controls of the GOC detailed above on steel products, including raw materials used in the production of COR, create an excess supply and therefore lower prices of raw materials for COR producers below what would exist in a competitive market, without such government controls. Although the CBSA is not conducting a subsidy investigation, the complainant provided information on subsidization of the Chinese steel industry and argues that this subsidization influences the price of steel products, including COR.Footnote 46 Previous CBSA positive findings of subsidized steel products in China is in itself evidence of the GOC’s indirect influence in the steel industry, including the flat-rolled steel industry sector. These subsidies provided to the producers of steel products in China have an indirect effect on domestic pricing of steel goods, including COR. As submitted in the complaint, Reuters reported, in 2014, that 88% of Chinese firms have received subsidies with a value worth USD 5.24 billion.Footnote 47 These subsidies reduce the domestic price of material inputs purchased by COR producers. This in turn incentivizes and allows COR producers to sell lower priced goods to customers. In conclusion, these subsidies allow Chinese steel enterprises, including cold-rolled and hot-rolled steel producers, to market steel and provide downstream COR producers lower priced input materials, which in turn allows the COR producers to sell COR at prices determined by factors other than the market conditions, resulting in prices lower than they would be without government subsidization. The support, through subsidies, of the steel industry and the flat-rolled steel industry sector by the GOC, is evidence that the GOC intended to assert control and influence the selling price of COR in the domestic market. The GOC’s measures, notices and observations detailed above illustrate that the GOC is closely administering the steel industry in China. Based on the information on the record as of the date of the final determination, the scope of the GOC’s macro-economic policies and measures provide a compelling factual basis that the GOC is influencing the Chinese steel industry, which encompasses the flat-rolled steel industry sector, including COR, the goods under investigation. The use of such policies and measures can dramatically change the demand and supply balance in the domestic market thereby materially altering the domestic prices of steel products such as steel slab, plate, hot-rolled steel sheet, cold-rolled steel sheet, as well as downstream products like COR. The major macro-economic policies and measures of the GOC include the 12th and 13th Five-Year Development Plans for the Steel Industry; the Steel Capacity Replacement Policy; the Iron and Steel Industry Adjustment and Upgrade Plan (2016 – 2020); the Steel Industry Adjustment Policy (2015 Revision); the National Steel Policy and the Steel Revitalization/Rescue Plan. These policies and measures have resulted in an environment where the commercial objectives of steel enterprises conflict with those of the GOC, affecting the type of products produced, production volumes and ultimately prices. In addition to the industrial policies and plans, the GOC closely administers the steel industry, including the flat-rolled steel industry sector, through state-ownership and state-control of upstream enterprises involved in the manufacture and supply of steel inputs, as well as COR producers. Furthermore, export controls and subsidization of the steel industry, including the flat-rolled steel industry sector, further demonstrates the GOC’s intent to exert control. In conclusion, the cumulative impact of these GOC actions, measures and control indicate that prices in the flat-rolled steel industry sector, which includes COR, are being indirectly determined by the GOC. The complainant submitted MEPS data, a publisher of steel market prices around the world, to compare hot-dipped galvanized steel prices (which includes COR) in China, to those in other markets. The table below demonstrates that prices of hot-dipped galvanized steel products in China are significantly lower than in other countries, suggesting the GOC’s involvement in the hot-dipped galvanized steel sector is affecting prices: hot-dipped galvanized steel prices in China were lower than domestic pricing in other markets by C$203/MT-C$557/MT in the past three years. The data shows that prices of hot-dipped galvanized steel (which includes COR) are significantly lower in China in comparison to prices in the United States, Canada, Japan and South Korea. 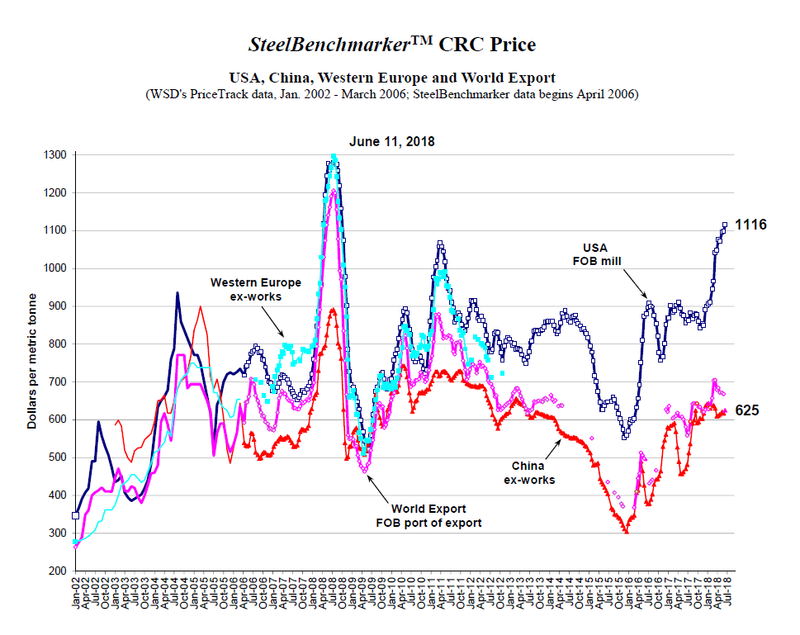 The CBSA was able to obtain information from SteelBenchmarker which collects and analyzes ex-mill prices of plate, scrap, hot-rolled band and cold-rolled coil in China, the United States and other regions, including prices during the review period from April 2017 to March 2018.Footnote 49 The SteelBenchmarker semi-monthly report also includes a summary chart of a domestic price comparison of cold-rolled coils (see chart below).Footnote 50 Based on the following chart depicting the prices of cold-rolled coil, the main material input in the production of COR, the CBSA reasonably concluded that FOB mill prices of COR in China in 2016 and 2017 were consistently lower than those in the United States by between 190-490 USD per MT, and also consistently lower than the world average prices to a lesser degree. As previously stated, the domestic price for cold-rolled and hot-rolled steel in China was also below the prices in the US Midwest and Indian markets. Given that cold-rolled and hot-rolled steel are commodity products freely traded on the world market, these disparities further support the assertion that domestic prices of COR in China are impacted by the distorted prices of steel inputs. The CBSA also compared the weighted average domestic selling prices of COR from companies who provided complete responses to the Dumping RFI, whose information was verified via on-site verification or via desk audit, and whose information was considered for the final determination in determining normal values. *For reasons of confidentiality, the data for South Korea and the Separate Customs Territory of Taiwan, Penghu, Kinmen and Matsu (Chinese Taipei) were combined, and actual selling prices not shown. From the graph above, a similar pattern emerges, whereby prices of COR in China are not the same as in other markets during the POI. The domestic selling prices of COR in China during the POI are consistently lower than in South Korea and the Separate Customs Territory of Taiwan, Penghu, Kinmen and Matsu (Chinese Taipei), and ranging in difference from $38 USD per metric tonne to $162 USD per metric tonne. The information discussed above supports the conclusion that the domestic prices of COR in China are not substantially the same as they would be if they were determined in a competitive market. Based on the above analysis, for the purposes of the final determination, the CBSA affirmed the opinion rendered at the preliminary determination that the conditions of paragraph 20(1)(a) of SIMA exist in the flat-rolled steel industry sector in China, which includes COR. Normal values could not be determined on the basis of the domestic selling prices in China or on the full cost of goods plus profit, because the CBSA formed the opinion that the conditions of paragraph 20(1)(a) of SIMA exist in the flat-rolled steel industry sector in China, which includes COR. Where section 20 conditions exist, the CBSA may determine normal values pursuant to paragraph 20(1)(c) or 20(1)(d) of SIMA which are normally based on the domestic selling prices of the like goods sold by surrogate producers designated by the President of the CBSA and adjusted for price comparability; or the cost of production of the like goods plus a reasonable amount for administrative, selling and all other costs, plus a reasonable amount for profits; or on the basis of the selling price in Canada of like goods imported from any source designated by the President of the CBSA and adjusted for price comparability. The CBSA designated the producers from the Separate Customs Territory of Taiwan, Penghu, Kinmen and Matsu (Chinese Taipei) as the appropriate surrogates. The Separate Customs Territory of Taiwan, Penghu, Kinmen and Matsu (Chinese Taipei) also has a significant flat-rolled steel industry, which includes COR. The CBSA received substantially complete responses to the Dumping RFI from producers/exporters in the Separate Customs Territory of Taiwan, Penghu, Kinmen and Matsu (Chinese Taipei) which were verified on-site during the course of this investigation. For the purposes of the final determination, normal values for the subject goods shipped by the exporters in China, who provided a substantially complete and reliable response to the Dumping RFI, were determined pursuant to paragraph 20(1)(c) of SIMA, using the information provided by the three producers/exporters in the Separate Customs Territory of Taiwan, Penghu, Kinmen and Matsu (Chinese Taipei). Where normal values could not be determined under paragraph 20(1)(c) of SIMA, the normal values were determined pursuant to ministerial specification in accordance with subsection 29(1) of SIMA using the domestic selling prices of the closest matching products, based on the consideration of the relevant characteristics, in the Separate Customs Territory of Taiwan, Penghu, Kinmen and Matsu (Chinese Taipei). Ansteel is a producer of the subject goods in China and Angang International is the export trading arm of Ansteel. During the POI, all the subject goods produced by Ansteel were shipped to Canada by Angang International. Ansteel and Angang International provided a joint response to the Dumping RFI.Footnote 52 Four Supplemental RFIs were sent to Ansteel and Angang International to gather additional information and seek clarification. Ansteel and Angang International provided joint responses to all Supplemental RFIs.Footnote 53 A desk audit was completed to review and verify the submissions provided by Ansteel and Angang International. Ansteel and Angang International’s response to the Dumping RFI was used to estimate the normal values and export prices for the purposes of the preliminary determination. However, during the final phase of the investigation, the CBSA’s review and verification of Ansteel and Angang International’s submissions uncovered inconsistencies and discrepancies in their submitted export sales information. As a result, Ansteel and Angang International’s submissions were considered to be unreliable and were not taken into account for the purposes of the final determination. For the final determination, the margin of dumping for Ansteel/Angang International is based on the “China - All Other Exporters” normal value and export price methodologies which are described later in this document. BSCR is a producer of like and subject goods located in China. Shougang International Trade & Engineering Corporation (SITE) is a related company located in China with whom BSCR has a vending agreement for all sales to SHHK. SHHK is a related company located in Hong Kong who is the vendor on all export sales from BSCR. Due to the relationship between BSCR and SHHK and their roles and responsibilities during the exportation process, the companies have collectively been determined to be the exporter for SIMA purposes. Where appropriate, the companies are referred to collectively as BSCR/SHHK. The three companies filed a joint response to the Dumping RFI by submitting only the relevant sections of the RFI as they apply to their specific role in the manufacturing and selling of like and subject goods.Footnote 54 A Deficiency Letter was sent to SITE as the CBSA did not initially receive a response from this entity.Footnote 55 In addition, Supplemental RFIs were sent to the three companies to gather additional information and seek clarification.Footnote 56 A desk audit was completed to review and verify the submissions provided by the three companies. As per the CBSA’s review and verification of the information, all of the issues raised in the deficiency letter and Supplemental RFIs were addressed. As a result, the three companies’ submissions, as a whole, were found to be substantially complete and reliable for the purposes of the final determination. As explained above, for exporters in China who were found to have provided substantially complete and reliable information in this investigation, normal values were determined pursuant to paragraph 20(1)(c) of SIMA, using the information provided by the three producers/exporters in the Separate Customs Territory of Taiwan, Penghu, Kinmen and Matsu (Chinese Taipei) during the PAP, or pursuant to subsection 29(1) of SIMA, using the domestic selling prices of the closest matching products, based on the consideration of the relevant characteristics, in the Separate Customs Territory of Taiwan, Penghu, Kinmen and Matsu (Chinese Taipei). For the subject goods shipped to Canada produced by BSCR during the POI, the export price was determined pursuant to section 24 of SIMA based on the SHHK’s selling price less all costs, charges and expenses resulting from the exportation of the good. For the purposes of the final determination, the total normal value compared to the total export price results in a margin of dumping of 3.6% for the BSCR/SHHK, expressed as a percentage of the total export price. Bengang Plates and Bengang Trading are related companies. Both companies are located in Benxi, Liaoning, China. Bengang Plates is a producer of the subject goods and Bengang Trading is the export trading arm of Bengang Plates. During the POI, all the subject goods produced by Bengang Plates were shipped to Canada by Bengang Trading. The subject goods were exported directly from China to Canada. Due to the relationship between Bengang Plates and Bengang Trading and their roles and responsibilities during the exportation process, the companies have collectively been determined to be the exporter for SIMA purposes. Where appropriate, the companies are referred to collectively as Bengang Plates/Bengang Trading. Bengang Trading and Bengang Plates responded to the Dumping RFI.Footnote 57 One Supplemental RFI was sent to Bengang Trading and four Supplemental RFIs were sent to Bengang Plates to gather additional information and seek clarification.Footnote 58 A desk audit was completed to review and verify the submissions provided by the companies. For the final determination, the submissions from Bengang Trading and Bengang Plates were considered to be substantially complete and reliable. For the subject goods shipped to Canada by Bengang Plates/Bengang Trading during the POI, the export price was determined pursuant to section 24 of SIMA based on the exporter’s selling price less all costs, charges and expenses resulting from the exportation of the goods. For the purposes of the final determination, the total normal value compared to the total export price results in a margin of dumping of 18.4% for Bengang Plates/Bengang Trading, expressed as a percentage of the total export price. BX Posco and Bengang Trading are related companies. Both companies are located in Benxi, Liaoning, China. BX Posco is a producer of the subject goods and Bengang Trading is the export trading arm of BX Posco. During the POI, all the subject goods produced by BX Posco were shipped to Canada by Bengang Trading. The subject goods were exported directly from China to Canada. Due to the relationship between BX Posco and Bengang Trading and their roles and responsibilities during the exportation process, the companies have collectively been determined to be the exporter for SIMA purposes. Where appropriate, the companies are referred to collectively as BX Posco/Bengang Trading. Bengang Trading and BX Posco responded to the Dumping RFI.Footnote 59 One Supplemental RFI was sent to Bengang Trading and four Supplemental RFIs were sent to BX Posco to gather additional information and seek clarification.Footnote 60 A desk audit was completed to review and verify the submissions provided by the companies. For the final determination, the submissions from Bengang Trading and BX Posco were considered to be substantially complete and reliable. For the subject goods shipped to Canada by BX Posco/Bengang Trading during the POI, the export price was determined pursuant to section 24 of SIMA based on the exporter’s selling price less all costs, charges and expenses resulting from the exportation of the goods. For the purposes of the final determination, the total normal value compared to the total export price results in a margin of dumping of 14.2% for BX Posco/Bengang Trading, expressed as a percentage of the total export price. Baotou Steel provided a response to the Dumping RFI.Footnote 61 However, Baotou Steel did not export any subject goods to Canada during the POI. As a result, the information provided by Baotou Steel was not used for the purposes of the final determination. JYZC, a foreign-owned company, is a producer and exporter of the subject goods located in Jiangyin, China. JYZC provided a response to the Dumping RFI.Footnote 62 Supplemental RFIs were sent to JYZC to gather additional information and seek clarification.Footnote 63 A desk audit was completed to review and verify the submission provided by the company. For the final determination, JYZC’s submission was considered to be substantially complete and reliable. For the subject goods shipped to Canada by JYZC during the POI, the export price was determined pursuant to section 24 of SIMA based on the exporter’s selling price less all costs, charges and expenses resulting from the exportation of the good. For the purposes of the final determination, the total normal value compared to the total export price results in a margin of dumping of 21.1% for JYZC, expressed as a percentage of the total export price. JUIS is a producer of like and subject goods located in China. Shougang International Trade & Engineering Corporation (SITE) is a related company located in China with whom JUIS has a vending agreement for all sales to SHHK. SHHK is a related company located in Hong Kong who is the vendor on all export sales from JUIS. Due to the relationship between JUIS and SHHK and their roles and responsibilities during the exportation process, the companies have collectively been determined to be the exporter for SIMA purposes. Where appropriate, the companies are referred to collectively as JUIS/SHHK. The three companies filed a joint response to the Dumping RFI by submitting only the relevant sections of the RFI as they apply to their specific role in the manufacturing and selling of like and subject goods.Footnote 64 A Deficiency Letter was sent to SITE as the CBSA did not initially receive a response from this entity.Footnote 65 In addition, Supplemental RFIs were sent to the three companies to gather additional information and seek clarification.Footnote 66 A desk audit was completed to review and verify the submission provided by the three companies. For the subject goods shipped to Canada produced by JUIS during the POI, the export price was determined pursuant to section 24 of SIMA based on the SHHK’s selling price less all costs, charges and expenses resulting from the exportation of the good. For the purposes of the final determination, the total normal value compared to the total export price results in a margin of dumping of 8.5% for JUIS/SHHK, expressed as a percentage of the total export price. YPC, a company incorporated in China, is a producer and exporter of the subject goods located in Changshu, China. During the POI, YPC sold the subject goods to Canada through a trading company. The subject goods were shipped directly from China to Canada. YPC provided a response to the Dumping RFI.Footnote 67 Supplemental RFIs were sent to YPC to gather additional information and seek clarification.Footnote 68 A desk audit was completed to review and verify the submission provided by the company. For the final determination, YPC’s submission was considered to be substantially complete and reliable. For the subject goods shipped to Canada by YPC during the POI, the export price was determined pursuant to section 24 of SIMA based on the exporter’s selling price less all costs, charges and expenses resulting from the exportation of the good. For the purposes of the final determination, the total normal value compared to the total export price results in a margin of dumping of 15.6% for YPC, expressed as a percentage of the total export price. For exporters of COR originating in or exported from China that did not provide a response to the Dumping RFI or did not furnish sufficient and reliable information, normal values and export prices were determined pursuant to a ministerial specification under subsection 29(1) of SIMA, which is based on a comparative analysis of facts available. In establishing the methodology for determining the normal value and export price under the ministerial specification, the CBSA analyzed all the information on the administrative record including the complaint filed by the domestic industry, the CBSA’s estimates at the initiation of the investigation, information submitted by exporters of the subject goods and CBSA customs entry documentation. The CBSA decided that the normal values and export prices determined for the exporters in China whose submissions were substantially complete and reliable for the final determination, rather than the information provided in the complaint or estimated at initiation, would be used to establish the methodology for determining normal values for all other exporters in China since it reflects more closely the exporters’ trading practices during the POI. Six exporters provided substantially complete and reliable submissions. The CBSA examined the difference between the normal value and export price for each individual transaction from these exporters in China in order to obtain an appropriate amount for the normal value methodology. The transactions were also examined to ensure that no anomalies were considered, such as very low volume and value, effects of seasonality or other business factors. No such anomalies were identified. The CBSA considered that the highest amount by which the normal value exceeded the export price (expressed as a percentage of the export price) on an individual transaction was an appropriate basis for determining normal values. This methodology limits the advantage that an exporter may gain from not providing necessary information requested in a dumping investigation as compared to an exporter that did provide the necessary information. Therefore, the normal values were determined under a ministerial specification pursuant to subsection 29(1) of SIMA, based on the export price, plus an amount equal to 53.3% of that export price, based on a transaction of YPC. The export prices were based on the CBSA customs entry documents of certain COR from China. The CBSA considers this the best available information on which to base the export prices of goods for all other exporters as it reflects actual import data. Based on the above methodologies, the margin of dumping for all other exporters of the subject goods originating in or exported from China is 53.3%, expressed as a percentage of the export price. CSC provided a response to the Dumping RFI.Footnote 69 However, CSC did not export any subject goods to Canada during the POI. As a result, the information provided by CSC was not used for the purposes of the final determination. PT is a producer and exporter of the subject goods located in Kaohsiung, the Separate Customs Territory of Taiwan, Penghu, Kinmen and Matsu (Chinese Taipei). During the POI, PT sold the subject goods to Canada through trading companies. The subject goods were shipped directly from the Separate Customs Territory of Taiwan, Penghu, Kinmen and Matsu (Chinese Taipei) to Canada. PT provided a response to the Dumping RFI.Footnote 70 A Supplemental RFI was sent to PT to gather additional information and seek clarification.Footnote 71 Officers of the CBSA performed an on-site verification at the premises of PT.Footnote 72 For the final determination, PT’s submission was considered to be substantially complete and reliable. Although PT had domestic sales of like goods during the PAP, normal values could not be determined in accordance with section 15 of SIMA as there were not such a number of sales of like goods that complied with all the terms and conditions referred to in sections 15 and 16 of SIMA as to permit a proper comparison with the sales of the goods to the importer in Canada. As such, normal values were determined pursuant to paragraph 19(b) of SIMA, based on the aggregate of the cost of production of the goods, a reasonable amount for administrative, selling and all other costs and a reasonable amount for profits. In this regard, the amount for profits was determined in accordance with subparagraph 11(1)(b)(ii) of SIMR by using PT’s profitable domestic sales of goods that were of the same general category as the subject goods shipped to Canada during the POI. For the subject goods shipped from PT to Canada during the POI, export prices were determined in accordance with section 24 of SIMA, based on the exporter’s selling price less all costs, charges and expenses resulting from the exportation of the goods. For the final determination, the total normal value compared with the total export price results in a margin of dumping of 11.0% for PT, expressed as a percentage of export price. SYSCO is a producer and exporter of the subject goods located in Kaohsiung, the Separate Customs Territory of Taiwan, Penghu, Kinmen and Matsu (Chinese Taipei). During the POI, SYSCO sold the subject goods to Canada through trading companies. The subject goods were shipped directly from the Separate Customs Territory of Taiwan, Penghu, Kinmen and Matsu (Chinese Taipei) to Canada. As per the CBSA’s review and verification of SYSCO’s submissions, the issues raised in the deficiency letter were addressed. For the final determination, SYSCO’s submission was considered to be substantially complete and reliable. SYSCO had domestic sales of like goods during the PAP. Normal values were either determined in accordance with section 15 of SIMA, based on domestic selling prices of like goods or in accordance with paragraph 19(b) of SIMA, based on the aggregate of cost of production, a reasonable amount for administrative, selling and all other costs, and a reasonable amount for profits. In this regard, the amount for profits was determined in accordance with subparagraph 11(1)(b)(ii) of the Special Import Measures Regulations (SIMR) by using SYSCO’s profitable domestic sales of goods that were of the same general category as the subject goods shipped to Canada during the POI. For the subject goods shipped from SYSCO to Canada during the POI, export prices were determined in accordance with section 24 of SIMA, based on the exporter’s selling price less all costs, charges and expenses resulting from the exportation of the goods. For the final determination, the total normal value compared with the total export price results in a margin of dumping of 4.8% for SYSCO, expressed as a percentage of export price. YPE is a producer and exporter of the subject goods to Canada located in Kaohsiung, the Separate Customs Territory of Taiwan, Penghu, Kinmen and Matsu (Chinese Taipei). YPE has two production facilities in the Separate Customs Territory of Taiwan, Penghu, Kinmen and Matsu (Chinese Taipei) that produce zinc-coated (galvanized) steel, aluminum-zinc coated steel and pre-painted steel. All the subject goods sold to Canada, as well domestic sales of like goods, were produced at the Kaohsiung production facility. YPE provided a response to the Dumping RFI.Footnote 76 Supplemental RFIs were sent to YPE to gather additional information and seek clarification.Footnote 77 Officers of the CBSA performed an on-site verification at the premises of YPE.Footnote 78 For the final determination, YPE’s submission was considered to be substantially complete and reliable. YPE had domestic sales of like goods during the PAP. Normal values were either determined in accordance with section 15 of SIMA, based on domestic selling prices of like goods or in accordance with paragraph 19(b) of SIMA, based on the aggregate of cost of production, a reasonable amount for administrative, selling and all other costs, and a reasonable amount for profits. In this regard, the amount for profits was determined in accordance with subparagraph 11(1)(b)(ii) of SIMR by using YPE’s profitable domestic sales of goods that were of the same general category as the subject goods shipped to Canada during the POI. For the subject goods shipped from YPE to Canada during the POI, export prices were determined in accordance with section 24 of SIMA, based on the exporter’s selling price less all costs, charges and expenses resulting from the exportation of the goods. For the final determination, the total normal value compared with the total export price results in a margin of dumping of 3.2% for YPE, expressed as a percentage of export price. For exporters of COR originating in or exported from the Separate Customs Territory of Taiwan, Penghu, Kinmen and Matsu (Chinese Taipei) that did not provide a response to the Dumping RFI or did not furnish sufficient and reliable information, normal values and export prices were determined pursuant to a ministerial specification under subsection 29(1) of SIMA, which is based on a comparative analysis of facts available. The CBSA decided that the normal values and export prices determined for the exporters in the Separate Customs Territory of Taiwan, Penghu, Kinmen and Matsu (Chinese Taipei) whose submissions were substantially complete and reliable for the final determination, rather than the information provided in the complaint or estimated at initiation, would be used to establish the methodology for determining normal values for all other exporters from the Separate Customs Territory of Taiwan, Penghu, Kinmen and Matsu (Chinese Taipei) since it reflects the exporters’ trading practices during the POI. Three exporters provided substantially complete and reliable submissions. 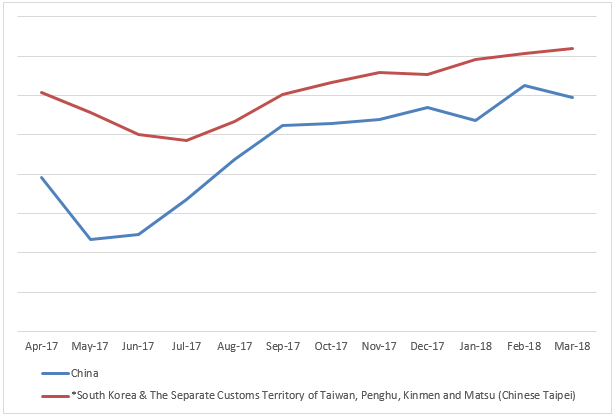 The CBSA examined the difference between the normal value and export price for each individual transaction from these exporters in the Separate Customs Territory of Taiwan, Penghu, Kinmen and Matsu (Chinese Taipei) in order to obtain an appropriate amount for the normal value methodology. The transactions were also examined to ensure that no anomalies were considered, such as very low volume and value, effects of seasonality or other business factors. No such anomalies were identified. Therefore, the normal values were determined under a ministerial specification pursuant to subsection 29(1) of SIMA, based on the export price, plus an amount equal to 33.2% of that export price, based on a transaction of PT. The export prices were based on the CBSA customs entry documents of certain COR from the Separate Customs Territory of Taiwan, Penghu, Kinmen and Matsu (Chinese Taipei). The CBSA considers this the best available information on which to base the export prices of goods for all other exporters as it reflects actual import data. Based on the above methodologies, the margin of dumping for all other exporters of the subject goods originating in or exported from the Separate Customs Territory of Taiwan, Penghu, Kinmen and Matsu (Chinese Taipei) is 33.2%, expressed as a percentage of the export price. JSW provided a response to the Dumping RFI.Footnote 79 The response was submitted to the CBSA after the due date of the RFI. The CBSA informed JSW that their submission was not filed in a timely fashion and was also deficient.Footnote 80 As a result, the information provided by JSW was not used for the purposes of the final determination. As no exporters of COR originating in or exported from India provided a substantially complete response to the Dumping RFI, normal values and export prices were determined pursuant to a ministerial specification under subsection 29(1) of SIMA, which is based on a comparative analysis of facts available. In establishing the methodology for determining the normal value and export price under the ministerial specification, the CBSA analyzed all the information on the administrative record including the complaint filed by the domestic industry, the CBSA’s estimates at the initiation of the investigation, information submitted by exporters of COR from China, the Separate Customs Territory of Taiwan, Penghu, Kinmen and Matsu (Chinese Taipei) and South Korea, and CBSA customs entry documentation. The CBSA decided that the normal values and export prices determined for the exporters in the Separate Customs Territory of Taiwan, Penghu, Kinmen and Matsu (Chinese Taipei) and South Korea whose submissions were substantially complete and reliable for the final determination, rather than the information provided in the complaint or estimated at initiation, would be used to establish the methodology for determining normal values for all exporters in India since it reflects more closely the exporters’ trading practices during the POI. Four exporters provided substantially complete and reliable submissions. As domestic prices in the Separate Customs Territory of Taiwan, Penghu, Kinmen and Matsu (Chinese Taipei) and South Korea occur in a competitive market, the CBSA considered that the information in respect of goods from the Separate Customs Territory of Taiwan, Penghu, Kinmen and Matsu (Chinese Taipei) and South Korea provides a reasonable basis for determining normal values for the subject goods from India. Information submitted by exporters in China was not considered, given that the President of the CBSA is of the opinion that conditions of paragraph 20(1)(a) of SIMA exist in the flat-rolled steel industry sector in China, which includes COR. The CBSA examined the difference between the determined normal value and export price for each individual transaction from these exporters in the Separate Customs Territory of Taiwan, Penghu, Kinmen and Matsu (Chinese Taipei) and South Korea in order to obtain an appropriate amount for the normal value methodology. The transactions were also examined to ensure that no anomalies were considered, such as very low volume and value, effects of seasonality or other business factors. No such anomalies were identified. Therefore, the normal values were determined under a ministerial specification pursuant to subsection 29(1) of SIMA, based on the export price, plus an amount equal to 40.0% of that export price, based on a transaction of Dongbu from South Korea. The export prices were based on the CBSA customs entry documents of certain COR from India. The CBSA considers this the best available information on which to base the export prices of goods for all exporters as it reflects actual import data. Based on the above methodologies, the margin of dumping for all exporters of the subject goods originating in or exported from India is 40.0%, expressed as a percentage of the export price. Dongbu is a producer and exporter of the subject goods located in Seoul, South Korea. During the POI, Dongbu sold the subject goods to Canada through four trading companies. The subject goods were shipped directly from South Korea to Canada. Dongbu provided a response to the Dumping RFI.Footnote 81 A Supplemental RFI was sent to Dongbu to gather additional information and seek clarification.Footnote 82 Officers of the CBSA performed an on-site verification at the premises of Dongbu.Footnote 83 For the final determination, Dongbu’s submission was considered to be substantially complete and reliable. Dongbu had domestic sales of like goods during the PAP. Normal values were either determined in accordance with section 15 of SIMA, based on domestic selling prices of like goods or in accordance with paragraph 19(b) of SIMA, based on the aggregate of cost of production, a reasonable amount for administrative, selling and all other costs, and a reasonable amount for profits. In this regard, the amount for profits was determined in accordance with subparagraph 11(1)(b)(ii) of SIMR by using Dongbu’s profitable domestic sales of goods that were of the same general category as the subject goods shipped to Canada during the POI. For the subject goods shipped from Dongbu to Canada during the POI, export prices were determined in accordance with section 24 of SIMA, based on the exporter’s selling price less all costs, charges and expenses resulting from the exportation of the goods. For the final determination, the total normal value compared with the total export price results in a margin of dumping of 9.0% for Dongbu, expressed as a percentage of export price. POSCO is a producer and exporter of the subject goods located in Seoul, South Korea. The CBSA’s review and verification of POSCO’s submission uncovered inconsistencies and discrepancies in certain submitted information pertaining to production and price discounts. As a result, POSCO’s submission was considered to be unreliable and was not taken into account for the purposes of the final determination. For the final determination, the margin of dumping for POSCO is based on the “South Korea - All Other Exporters” normal value and export price methodologies which are described later in this document. POSCO C&C is a producer and exporter of the subject goods located in Pohang, South Korea. Although POSCO C&C’s information was used for the preliminary determination, in the final phase of the investigation, the CBSA’s review and verification of POSCO C&C’s submission uncovered inconsistencies and discrepancies in certain submitted information pertaining to production and price discounts. As a result, POSCO C&C’s submission was considered to be unreliable and was not taken into account for the purposes of the final determination. For the final determination, the margin of dumping for POSCO C&C is based on the “South Korea - All Other Exporters” normal value and export price methodologies which are described later in this document. For exporters of COR originating in or exported from South Korea that did not provide a response to the Dumping RFI or did not furnish sufficient and reliable information, normal values and export prices were determined pursuant to a ministerial specification under subsection 29(1) of SIMA, which is based on a comparative analysis of facts available. The CBSA decided that the normal values and export prices determined for the exporter in South Korea whose submission was substantially complete and reliable for the final determination, rather than the information provided in the complaint or estimated at initiation, would be used to establish the methodology for determining normal values for all other exporters in South Korea since it reflects exporter trading practices during the POI. Dongbu provided a substantially complete and reliable submission. The CBSA examined the difference between the normal value and export price for each individual transaction from the exporter in South Korea in order to obtain an appropriate amount for the normal value methodology. The transactions were also examined to ensure that no anomalies were considered, such as very low volume and value, effects of seasonality or other business factors. No such anomalies were identified. Therefore, the normal values were determined under a ministerial specification pursuant to subsection 29(1) of SIMA, based on the export price, plus an amount equal to 40.0% of that export price, based on a transaction of Dongbu. The export prices were based on the CBSA customs entry documents of certain COR from South Korea. The CBSA considers this the best available information on which to base the export prices of goods for all other exporters as it reflects actual import data. Based on the above methodologies, the margin of dumping for all other exporters of the subject goods originating in or exported from South Korea is 40.0%, expressed as a percentage of the export price. As can be seen from the table above, the goods under investigation have been dumped and the margins of dumping determined in respect of the goods of the exporters are greater than the threshold of 2% and are therefore not considered insignificant. As a result, the legislative requirement is satisfied for making a final determination of dumping. A summary of the results of the dumping investigation respecting the subject goods released into Canada during the dumping POI are presented in Appendix 1. On January 22, 2019, pursuant to paragraph 41(1)(b) of SIMA, the CBSA made a final determination of dumping respecting COR originating in or exported from China, the Separate Customs Territory of Taiwan, Penghu, Kinmen and Matsu (Chinese Taipei), India and South Korea. The provisional period began on October 24, 2018, and will end on the date the CITT issues its finding. The CITT is expected to issue its decision by February 21, 2019. Provisional anti-dumping duty will continue to apply until this date on imports of the subject goods. For further details on the application of provisional duty, refer to the Statement of Reasons issued for the preliminary determination, which is available through the CBSA’s website at: www.cbsa-asfc.gc.ca/sima-lmsi/menu-eng.html. If the CITT finds that the dumped goods have caused injury, the anti-dumping duty payable on the subject goods released by the CBSA during the provisional period will be finalized pursuant to section 55 of SIMA. Imports released by the CBSA after the date of the CITT’s finding will be subject to anti-dumping duty equal to the margin of dumping. The importer in Canada shall pay all applicable duty. If the importers of such goods do not indicate the required SIMA code or do not correctly describe the goods in the customs documents, an administrative monetary penalty could be imposed. The provisions of the Customs Act apply with respect to the payment, collection or refund of any duty collected under SIMA. As a result, failure to pay duty within the prescribed time will result in the application of interest. Under certain circumstances, anti-dumping duty can be imposed retroactively on the subject goods imported into Canada. When the CITT conducts its inquiry on material injury to the Canadian industry, it may consider if dumped goods that were imported close to or after the initiation of the investigation constitute massive importations over a relatively short period of time and have caused injury to the Canadian industry. Should the CITT issue a finding that there were recent massive importations of dumped goods that caused injury, imports of the subject goods released by the CBSA in the 90 days preceding the day of the preliminary determination could be subject to anti-dumping duty. The following table lists the estimated margins of dumping and the provisional duty by exporter as a result of the decision mentioned above. Imports of subject goods released from the Canada Border Services Agency on or after October 24, 2018, will be subject to provisional duty at the rates specified below. Note: The margins of dumping reported in this table were determined by the Canada Border Services Agency (CBSA) for the purposes of the final determination of dumping. These margins may not reflect the amount of anti-dumping duty to be levied on future importations of dumped goods. In the event of an injury finding by Canadian International Trade Tribunal, normal values for future shipments to Canada have been provided to the exporters who provided sufficient information to the CBSA, as appropriate. These normal values would come into effect the day after an injury finding. Information regarding normal values of the subject goods should be obtained from the exporters. Imports from any other exporters will be subject to an anti-dumping duty rate, as applicable, in accordance with a ministerial specification and in an amount equal to the margin of dumping found for “all other exporters” at the final determination. Please consult the SIMA Self-Assessment Guide for more detailed information explaining how to determine the amount of Special Import Measures Act (SIMA) duty owing. The CBSA considered information provided by the Canadian producers, producers/exporters of certain corrosion-resistant steel sheet (COR), information obtained through its own research and previous CBSA’s section 20 inquiries respecting steel products from China. Based on the information, the CBSA formed the opinion that the conditions of paragraph 20(1)(a) of SIMA apply in the flat-rolled steel industry sector in China, which includes COR. The CBSA further concluded that domestic sales and costing information in the Separate Customs Territory of Taiwan, Penghu, Kinmen and Matsu (Chinese Taipei), submitted by producers/exporters whose submissions were considered to be substantially complete and reliable and verified on-site, was appropriate for calculating normal values pursuant to subparagraphs 20(1)(c)(i) and (ii), as well as subsection 29(1) of SIMA. Further details respecting the results of the CBSA’s section 20 inquiry can be found in the “Section 20 Inquiry” portion of this document. PT,Footnote 111 POSCO C&C,Footnote 112 POSCO,Footnote 113 Shougang CR (Shougang Group) and Shougang Jingtang (Shougang Group)Footnote 114 and DongbuFootnote 115 argued that they should be deemed the exporter for SIMA purposes as they were the principals in the sales transactions and meet all the conditions set out in the CBSA guidelines for the determination of the exporter. The CBSA conducted its own analysis of information provided by the parties and gathered via on-site verification and desk audit. After considering all information available on the administrative record, including the information gathered during on-site verification, the CBSA has determined that in this investigation, the producers or entities that included the producers were the exporters for SIMA purposes. Submissions provided by Bengang Steel Plates Co., Ltd., Benxi Iron & Steel (Group) International Economic and Trading Co., Ltd., BX Steel POSCO Cold Rolled Sheet Co., Ltd., Dongbu, Jiangyin ZongCheng Steel Co., Ltd., PT, SYSCO, Shougang CR (Shougang Group) and Shougang Jingtang (Shougang Group), Yieh Phui (China) Technomaterial Co., Ltd. and Yieh Phui Enterprise Co., Ltd. were reviewed and verified by the CBSA and found to be substantially complete and reliable for the purposes of the final determination. The CBSA conducted on-site verifications at the premises of POSCO and POSCO C&C. Their submissions were reviewed and found to be unreliable for the purposes of the final determination. Exhibit 2 (NC) - Non-confidential Complaint filed by ArcelorMittal Dofasco G.P. - Attachment 6. Exhibit 12 (NC) - Importer RFI. Exhibit 10 (NC) - Exporter RFI - Dumping. Exhibit 13 (NC) - Exporter RFI - Section.20 - China. In the Statement of Reasons concerning the preliminary determination, the total number of respondents reflected only the exporters who provided a substantially complete response to the Dumping RFI. Exhibits 277 (PRO) and 278 (NC) - Verification Exhibit - POSCO Daewoo Corporation. ; and Exhibits 229 (PRO) and 230 (NC) - Verification Exhibit - Soon Hong Trading Co., Ltd.
Exhibit 11 (NC) - Foreign Government RFI - Section 20 - China. Exhibit 2 (NC) - Non-confidential Complaint filed by ArcelorMittal Dofasco G.P., paragraphs 22-28. Exhibit 2 (NC) - Non-confidential Complaint filed by ArcelorMittal Dofasco G.P., paragraphs 29-32. Exhibit 2 (NC) - Non-confidential Complaint filed by ArcelorMittal Dofasco G.P., paragraph 33. Canadian International Trade Tribunal; Corrosion-Resistant Steel Sheet Dumping Determination and Reasons (October 9, 2018), PI-2018-005, paragraphs 15-17. Exhibit 2 (NC) - Non-confidential Complaint filed by ArcelorMittal Dofasco G.P., paragraphs 363-425. Exhibits 87 (PRO) and 88 (NC) - Response to Section 20 RFI - JYZC; Exhibits 95 (PRO) and 96 (NC) - Response to Section 20 RFI - YPC; Exhibits 101 (PRO) and 102 (NC) - Response to Section 20 RFI - Bengang Steel Plates Co.,Ltd. ; and Exhibits 105 (PRO) and 106 (NC) - Response to Section 20 RFI - BX Steel POSCO Cold Rolled Sheet Co.,Ltd. Section 20 Report Attachments (NC) - Attachment 1 (NC) - 13th Five-Year Plan for Economic and Social Development. Section 20 Report Attachments (NC) - Attachment 1 (NC) - 13th Five-Year Plan for Economic and Social Development, chapter 11. Section 20 Report Attachments (NC) - Attachment 3 (NC) - Steel Capacity Replacement Policy - Chinese Version only. Section 20 Report Attachments (NC) - Attachment 4 (NC) - China Vows to Meet Targets to Cut Steel Production Capacity in 2018. Section 20 Report Attachments (NC) - Attachment 5 (NC) - Iron and Steel Industry Adjustment and Upgrade Plan (2016-2020) - Chinese Version only. Section 20 Report Attachments (NC) - Attachment 6 (NC) - Comments on China's Steel Industry Adjustment Policy (2015 Revision), page 1. Section 20 Report Attachments (NC) - Attachment 6 (NC) - Comments on China's Steel Industry Adjustment Policy (2015 Revision), page 2. Section 20 Report Attachments (NC) - Attachment 6 (NC) - Comments on China's Steel Industry Adjustment Policy (2015 Revision), page 3. Section 20 Report Attachments (NC) - Attachment 6 (NC) - Comments on China's Steel Industry Adjustment Policy (2015 Revision), page 4. Section 20 Report Attachments (NC) - Attachment 7 (NC) - Iron and Steel Industrial Restructuring Policy (2015 Revision). Exhibit 2 (NC) - Non-confidential Complaint filed by ArcelorMittal Dofasco G.P., page 141, para. 390. Exhibit 2 (NC) - Non-confidential Complaint filed by ArcelorMittal Dofasco G.P., page 141, para. 391. Section 20 Report Attachments (NC) - Attachment 8 (NC) - China's Steel Industry Improves as Capacity Reduction Pays off. Section 20 Report Attachments (NC) - Attachment 9 (NC) - The Clean Technology Revolution and its Implications for Europe. Section 20 Report Attachments (NC) - Attachment 10 (NC) - China Making Headway Restructuring Steel Industry. Section 20 Report Attachments (NC) - Attachment 11 (NC) - Development Policies of the Iron and Steel Industry. Section 20 Report Attachments (PRO) - Attachment 12 (NC) - Blueprint for the Adjustment and Revitalization of the Steel Industry. Section 20 Report Attachments (NC) - Attachment 13 (NC) - 12th Five-Year Development Plan for the Steel Industry. Section 20 Report Attachments (NC) - Attachment 15 (NC) - Criterion for the Production and Operation of Steel Industry. Section 20 Report Attachments (NC) - Attachment 16 (NC) - Several Observations of the General Office of the State Council on Further Strengthening Energy-saving and Emission Reduction Efforts as well as Accelerating of Restructuring of Steel Industry. Section 20 Report Attachments (NC) - Attachment 17 (NC) - Top Steelmakers in 2017 - World Steel Association. Exhibit 2 (NC) - Non-confidential Complaint filed by ArcelorMittal Dofasco G.P., page 148, para. 408. Exhibit 2 (NC) - Non-confidential Complaint filed by ArcelorMittal Dofasco G.P., page 150, para. 412. Exhibit 2 (NC) - Non-confidential Complaint filed by ArcelorMittal Dofasco G.P., page 150, para. 413. Exhibit 2 (NC) - Non-confidential Complaint filed by ArcelorMittal Dofasco G.P., page 150, para. 412, Table 31. Exhibit 2 (NC) - Non-confidential Complaint filed by ArcelorMittal Dofasco G.P., page 150, para. 413, Table 32. Section 20 Report Attachments (NC) - Attachment 19 (NC) - China's Billet Export Tax Lowered to 15%, Metal Bulletin. Exhibit 2 (NC) - Non-confidential Complaint filed by ArcelorMittal Dofasco G.P., page 151, para. 414. Exhibit 2 (NC) - Non-confidential Complaint filed by ArcelorMittal Dofasco G.P., page 151, para. 415. Exhibit 1 (PRO) - Confidential Complaint filed by ArcelorMittal Dofasco G.P. - page 154, para. 422, Table 34. Section 20 Report Attachments (NC) - Attachment 20 (NC) - Price History, SteelBenchmarker, pages 9, 12 and 15. Section 20 Report Attachments (NC) - Attachment 20 (NC) - Price History, SteelBenchmarker, page 5. Attachment 21 (PRO) - PD Section 20 Domestic Selling Pricing Analysis. Exhibits 122 (PRO) and 123 (NC) - Response to Dumping RFI - Angang Steel Company. Exhibits 204 (PRO) and 205 (NC) - Response to Supplemental RFI #1 - Ansteel, Angang HK and Angang International; Exhibits 258 (PRO) and 259 (NC) - Response to Supplemental RFI #2 - Ansteel, Angang HK and Angang International; Exhibits 260 (PRO) and 261 (NC) - Response to Supplemental RFI #3 - Ansteel, Angang HK and Angang International; and Exhibits 271 (PRO) and 272 (NC) - Response to Supplemental RFI #4 - Ansteel, Angang HK and Angang International. Exhibits 62 (PRO) and 63 (NC) - Response to Dumping RFI - BSCR; Exhibits 60 (PRO) and 61 (NC) - Response to Dumping RFI - SHHK; and Exhibits 128 (PRO) and 129 (NC) - Response to Dumping RFI - SITE. Exhibits 130 (PRO) and 131 (NC) - Response to Deficiency Notice - SHHK. Exhibits 162 (PRO) and 163 (NC) - Response to Supplemental RFI #1 - Shougang Group; Exhibits 218 (PRO) and 219 (NC) - Response to Supplemental RFI #2 - Shougang Group; Exhibits 247 (PRO) and 248 (NC) - Response to Supplemental RFI #3 - Shougang Group; Exhibits 256 (PRO) and 257 (NC) - Response to Supplemental RFI #4 - Shougang Group; Exhibits 302 (PRO) and 303 (NC) - Response to Supplemental RFI #5 - Shougang Group; Exhibits 300 (PRO) and 301 (NC) - Response to Supplemental RFI #6 - Shougang Group; and Exhibit 304 (NC) - Response to Supplemental RFI #7 - Shougang Group. Exhibits 99 (PRO) and 100 (NC) - Response to Dumping RFI - Bengang Plates; Exhibits 107 (PRO) and 108 (NC) - Response to Dumping RFI - Bengang Trading HK; and Exhibits 109 (PRO) and 110 (NC) - Response to Dumping RFI - Bengang Trading America. Exhibits 287 (PRO) and 288 (NC) - Response to Supplemental RFI #1 - Bengang Trading Group; Exhibits 289 (PRO) and 290 (NC) - Response to Supplemental RFI #1 & #2 - Bengang Group; Exhibits 268 (PRO) and 269 (NC) - Response to Supplemental RFI #3 - Bengang Group; and Exhibits 305 (PRO) and 306 (NC) - Response to Supplemental RFI #4 - Bengang Group. Exhibits 103 (PRO) and 104 (NC) - Response to Dumping RFI - BX Posco; Exhibits 107 (PRO) and 108 (NC) - Response to Dumping RFI - Bengang Trading HK; and Exhibits 109 (PRO) and 110 (NC) - Response to Dumping RFI - Bengang Trading America. Exhibits 287 (PRO) and 288 (NC) - Response to Supplemental RFI #1 & #2 - Bengang Trading Group; Exhibits 289 (PRO) and 290 (NC) - Response to Supplemental RFI #1- BX Posco; Exhibits 268 (PRO) and 269 (NC) - Response to Supplemental RFI #3 - Bengang Group; and Exhibits 305 (PRO) and 306 (NC) - Response to Supplemental RFI #4 - Bengang Group. Exhibits 126 (PRO) and 127 (NC) - Response to Dumping RFI - Baotou Steel. Exhibits 89 (PRO) and 90 (NC) - Response to Dumping RFI - JYZC. Exhibits 191 (PRO) and 192 (NC) - Response to Supplemental Dumping RFI #1 - JYZC; and Exhibits 224 (PRO) and 225 (NC) - Response to Supplemental Dumping RFI #2 - JYZC. Exhibits 64 (PRO) and 65 (NC) - Response to Dumping RFI - JUIS; Exhibits 60 (PRO) and 61 (NC) - Response to Dumping RFI - SHHK; and Exhibits 128 (PRO) and 129 (NC) - Response to Dumping RFI - SITE. Exhibits 93 (PRO) and 94 (NC) - Response to Dumping RFI - YPC. Exhibits 201 (PRO) and 202 (NC) - Response to Supplemental RFI #1 - YPC; Exhibit 203 (PRO) - Response to Supplemental RFI #2 - YPC; and Exhibits 297 (PRO) and 298 (NC) - Response to Supplemental RFI #3 - YPC. Exhibits 82 (PRO) and 83 (NC) - Response to Dumping RFI - CSC. Exhibits 85 (PRO) and 86 (NC) - Response to Dumping RFI - PT. Exhibits 199 (PRO) and 200 (NC) - Response to Supplemental RFI #1 - PT. Exhibits 273 (PRO) and 274 (NC) - Verification Exhibit - PT. Exhibits 76 (PRO) and 77 (NC) - Response to Dumping RFI - SYSCO. Exhibits 155 (PRO) and 156 (NC) - Response to Deficiency Letter and Supplemental RFI #1 - SYSCO. Exhibits 281 (PRO) and 282 (NC) - Verification Exhibit - SYSCO. Exhibits 97 (PRO) and 98 (NC) - Response to Dumping RFI - YPE. Exhibits 159 (PRO) and 160 (NC) - Response to Supplemental RFI #1 - YPE. Exhibits 238 (PRO) and 239 (NC) - Verification Exhibit - YPE. Exhibits 213 (PRO) and 212 (NC) - Response to Dumping RFI - JSW Steel Coated Products Limited. Exhibit 284 (PRO) - Letter sent to JSW Steel Coated Products Limited regarding response to RFI. Exhibits 73 (PRO) and 74 (NC) - Response to Dumping RFI - Dongbu. Exhibits 170 (PRO) and 171 (NC) - Response to Supplemental RFI #1 - Dongbu. Exhibits 236 (PRO) and 237 (NC) - Verification Exhibit - Dongbu. Exhibits 66 (PRO) and 67 (NC) - Response to Dumping RFI - POSCO. Exhibits 139 (PRO) and 140 (NC) - Response to Supplemental RFI #1 - POSCO; Exhibits 166 (PRO) and 167 (NC) - Response to Supplemental RFI #2 - POSCO; Exhibits 172 (PRO) and 173 (NC) - Response to Supplemental RFI #3 - POSCO; and Exhibits 193 (PRO) and 194 (NC) - Response to Supplemental RFI #4 - POSCO. Exhibits 275 (PRO) and 276 (NC) - Verification Exhibit - POSCO. Exhibits 58 (PRO) and 59 (NC) - Response to Dumping RFI - POSCO C&C. Exhibits 137 (PRO) and 138 (NC) - Response to Supplemental RFI #1 - POSCO C&C; and Exhibits 168 (PRO) and 169 (NC) - Response to Supplemental RFI #2 - POSCO C&C. Exhibits 279 (PRO) and 280 (NC) - Verification Exhibit - POSCO C&C. Exhibits 327 (PRO) and 328 (NC) - Case Briefs Filed on Behalf of ArcelorMittal Dofasco G.P. and Stelco Inc.
Exhibit 321 (NC) - Case Briefs Filed on Behalf of China Steel Corporation. Exhibits 323 (PRO) and 324 (NC) - Case Briefs Filed on Behalf of Dongbu Steel Co., Ltd.
Exhibit 322 (NC) - Case Briefs Filed on Behalf of JFE Shoji Trade America Inc.
Exhibit 315 (NC) - Case Briefs Filed on Behalf of POSCO. Exhibit 316 (NC) - Case Briefs Filed on Behalf of POSCO Coated and Color Co., Ltd.
Exhibits 317 (PRO) and 318 (NC) - Case Briefs Filed on Behalf of Prosperity Tieh Enterprise Co., Ltd.
Exhibits 319 (PRO) and 320 (NC) - Case Briefs Filed on Behalf of Sheng Yu Steel Co., Ltd.
Exhibits 325 (PRO) and 326 (NC) - Case Briefs Filed on Behalf of the Shougang group. Exhibits 336 (PRO) and 337 (NC) - Reply Submissions from ArcelorMittal Dofasco G.P. and Stelco Inc.
Exhibit 331 (NC) - Reply Submissions from China Steel Corporation. Exhibit 339 (NC) - Reply Submissions from Dongbu Steel Co., Ltd.
Exhibits 334 (PRO) and 335 (NC) - Reply Submissions from POSCO. Exhibits 332 (PRO) and 333 (NC) - Reply Submissions from POSCO Coated & Color Steel Co., Ltd.
Exhibit 338 (NC) - Reply Submissions from the Shougang group. Exhibits 329 (PRO) and 330 (NC) - Reply Submissions from Prosperity Tieh Enterprise Co., Ltd.
Exhibit 328 (NC) - Case Briefs Filed on Behalf of ArcelorMittal Dofasco G.P. and Stelco Inc., paragraphs 4 to 9. Exhibit 328 (NC) - Case Briefs Filed on Behalf of ArcelorMittal Dofasco G.P. and Stelco Inc., paragraph 10. Exhibit 328 (NC) - Case Briefs Filed on Behalf of ArcelorMittal Dofasco G.P. and Stelco Inc., paragraphs 11 to 20. Exhibit 328 (NC) - Case Briefs Filed on Behalf of ArcelorMittal Dofasco G.P. and Stelco Inc., paragraphs 38, 63, 66 to 68, 73. Exhibits 330 (NC) - Reply Submissions from Prosperity Tieh Enterprise Co., Ltd., paragraph 7. Exhibit 333 (NC) - Reply Submissions from POSCO Coated & Color Steel Co., Ltd. (POSCO C&C), paragraph 17. Exhibit 335 (NC) - Reply Submissions from POSCO, Republic of Korea, paragraph 11. Exhibit 338 (NC) - Reply Submissions from Beijing Shougang Cold Rolling Co., Ltd. ("Shougang CR"), Shougang Jingtang United Iron & Steel Co., Ltd. ("Shougang Jingtang"), Shougang Holding Trade (Hong Kong Ltd. ("Shougang Holding"), and China Shougang International Trade & Engineering Corporation ("Shougang International"), paragraphs 5 to 7. Exhibit 339 (NC) - Reply Submissions from Dongbu Steel Co., Ltd. ("Dongbu"), paragraph 10. Exhibit 320 (NC) - Case Briefs Filed on Behalf of Sheng Yu Steel Co., Ltd., page 2, paragraph 7. Exhibit 333 (NC) - Reply Submissions from POSCO Coated and Color Co., Ltd. (POSCO C&C), paragraph 18. Exhibit 335 (NC) - Reply Submissions from POSCO, Republic of Korea, paragraph 29. Exhibit 338 (NC) - Reply Submissions from Beijing Shougang Cold Rolling Co., Ltd. ("Shougang CR"), Shougang Jingtang United Iron & Steel Co., Ltd. ("Shougang Jingtang"), Shougang Holding Trade (Hong Kong Ltd. ("Shougang Holding"), and China Shougang International Trade & Engineering Corporation ("Shougang International"), paragraph 13. Exhibit 338 (NC) - Reply Submissions from Beijing Shougang Cold Rolling Co., Ltd. ("Shougang CR"), Shougang Jingtang United Iron & Steel Co., Ltd. ("Shougang Jingtang"), Shougang Holding Trade (Hong Kong Ltd. ("Shougang Holding"), and China Shougang International Trade & Engineering Corporation ("Shougang International"), paragraph 12. Exhibit 339 (NC) - Reply Submissions from Dongbu Steel Co., Ltd. ("Dongbu"), paragraph 20.